A colourful home-made dessert to finish off a good meal. Toast the oats in a frying pan until golden, cool. Mix together the yogurt, custard and oats. Place in a freezer-proof container and freeze for 2 hours. Meanwhile, cook the raspberries and honey in a small saucepan for 5 minutes until softened. Allow to cool. 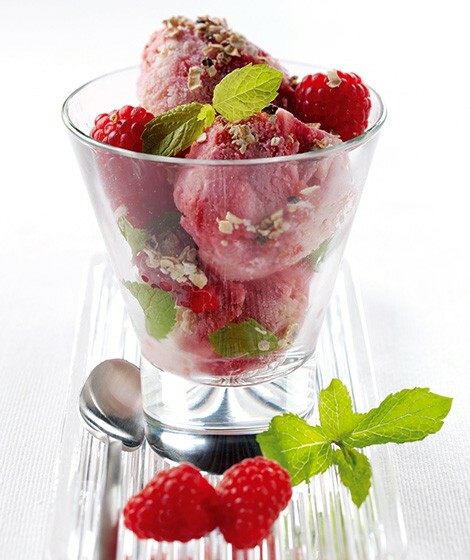 Stir the raspberries into the yogurt to create a marbled effect and freeze for a further 2-3 hours. Remove from the freezer for about 30 minutes before serving to soften a little. Serve with fresh raspberries and mint then sprinkle with toasted oats. Try using fresh strawberries instead of raspberries and puree in a food processor, or use flavoured yogurts.